As described in the various biographical pages, Dorothy was a professional portrait painter before she became a writer, and was exhibited in the Royal Scottish Academy. Her artist's eye is of course clearly evident in her writing in the rich and evocative descriptions, ability to capture the smallest detail, and her wonderful evocation of colour. The majority of her best works were produced as commisions for private clients so are not available for public viewing, but there were some for public spaces such as the one of Duncan Macrae below, while her portrait of Lord Wheately may be viewable for visitors to the House of Binns, which is open to the public. The other exceptions were of course the portraits of her family and the following one of Archie Abernethy. I believe that she painted mainly under maiden name of Halliday and as I found with the Macrae painting it isn't always realised that she was also the celebrated author. Dorothy only ever produced one painting of one of her fictional characters, when a Canadian reader commisioned her to paint a character of her choice. 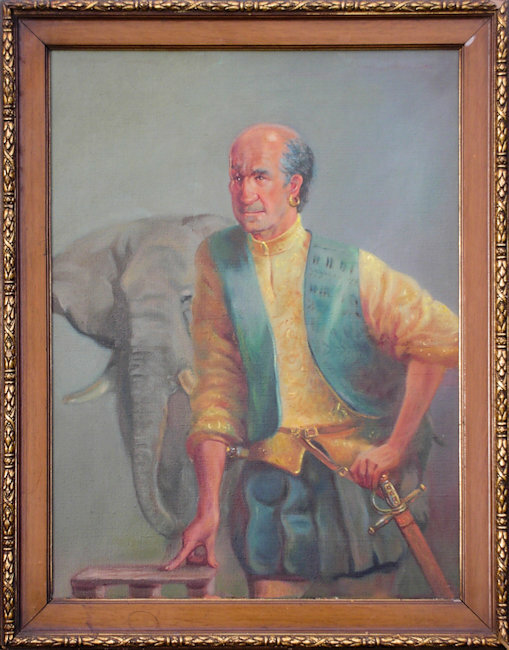 She chose Archie Abernethy, who of course is first introduced to us as the Turkish elephant keeper but is soon revealed as a Scot from Partick and grows to become one of our best loved characters and the most loyal of Lymond and Philippa's friends. The painting had been completed and was about to be sent off when the reader sadly died and his wife wrote to cancel the commision. It thus remained in Dorothy's house, displayed on the staircase next to her portraits of Alastair and the rest of her family, until her death. It now belongs to a reader in England. Duncan Macrae (1905-1967) was a celebrated Scottish stage actor and comedian who also appeared in many films and on TV. His most famous stage role was that of King James VI - Jamie the Saxt - which ran at the Citizen's Theatre in Glasgow and Dorothy was commissioned to paint him in that role. The sittings took place at her house and the book in his right hand was one of Alastair's antiquarian collection. Macrae however kept falling asleep and dropping the book so a cushion had to be suitably placed to catch it. You can see the Honours of Scotland in the lower right, and in order to get these correct she needed to study and sketch the real items. However that is impossible during the day when tourists flock to see them in the stongroom at Edinburgh Castle, so she had to get permission to be locked into the room overnight when she could sketch them in peace. The resultant very large and imposing portrait hung in the Citizen's Theatre for many years and is now at the People's Palace Museum on Glasgow Green. I asked Dorothy about her other paintings in May 2000 and she supplied the following information. Two portraits are on display in the House of the Binns in West Lothian - the home of Tam and Kathleen Dalyell and which is now owned by the National Trust for Scotland. They are of Kathleen's parents Lord and Lady Wheatley. The former was used on the book jacket of Lord Wheatley's memoirs which was published by Butterworth. 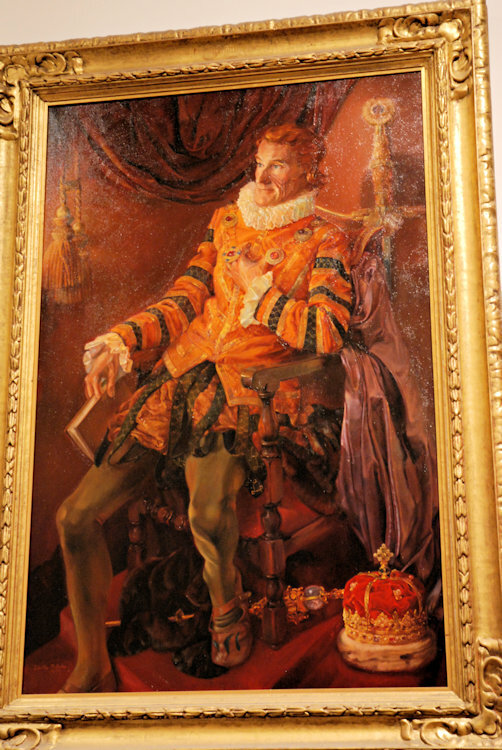 In Canada there is a portrait of Lord Thomson of Fleet as Chancellor of New Brunswick University. There used to be one of his son in the Scotsman Building but she believed it was sent to Canada when the Scotsman changed ownership and moved to their new premises. All the others she believed were in private ownership. I know of one further portrait - her final one - which was of and for her friend, Rev. Charles Robertson, who retired a few years ago after many years as Minister of the Canongate Kirk in Edinburgh and Chaplain to the Queen. I saw it in the Canongate Manse shortly before he and his wife were due to move house and I presume it is still there.